I know sometimes there is more to life than our ancestors and life has to go on. No problem here up North. This morning I got a new picture from an old friend out on the West Coast. I never met her personally, but we share the same passion: genealogy and old pictures. Such a precious friend and such a precious picture. This photo is about Silvia Bleau with her mother Agnes Alexandre. Silvia Bleau Combe is in the forefront and Agnes is seen on the picture on the wall. This is my precious friend’s e-mail. I had to share it also like I did with close to 100 pictures she took the time to scan. Hello, it’s been a while. I have been busy researching for someone and I am almost done. 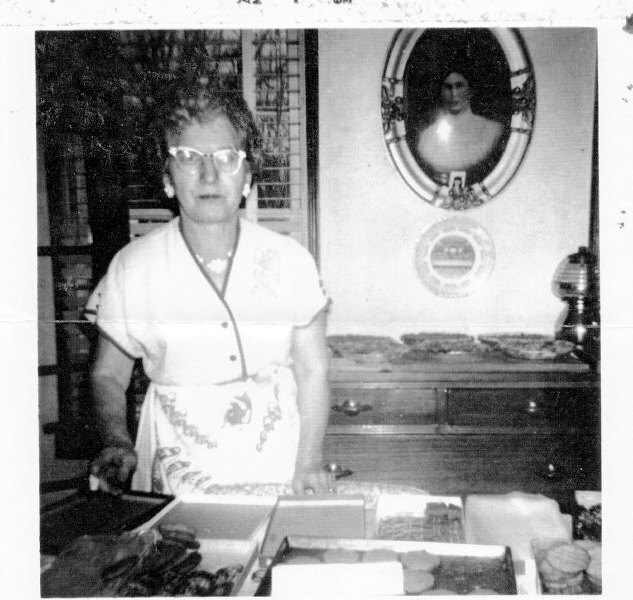 Here is the photo that I told you about, it comes from my husband’s cousin, the woman cooking is Silvia Bleau, the photo on the wall is her mother, Agnes Alexander. They really resemble each other. No one seems to know where that photo on the wall is now. It is not a very good copy but it’s the best they could do. I have enjoyed the blogs, sorry I have not made any comments about it, I have been so busy.